More than 30,000 refugees have crossed into Croatia and they need the Internet. camera (Project Open Network, otvorenamreza.org ) Project Open Network volunteer talking with refugees and migrants in Tovarnik, Croatia, on September 20th. Whether refugees and migrants are waiting in reception camps or on the move towards the next European country on their journey, one need is constant and that's access to the Internet. In Croatia, where more than 30,000 refugees and migrants have crossed into since Hungary closed its borders last week, one tech start-up is helping them get Wi-Fi access by carrying hotspots on their backs. “3G network is working ok when we arrived, the rate was even a little over 5 Mbps but was soon stopped working,” the company called Otvorena mreža, or "Project Open Network,” wrote on its Facebook page, adding that the network connection is constantly dropping out. After collecting donations of 3G USB sticks, external batteries, wireless routers and SIM cards, volunteers carried backpacks with mobile Wi-Fi devices to crowded locations such as Tovarnik and Beli Manastir. 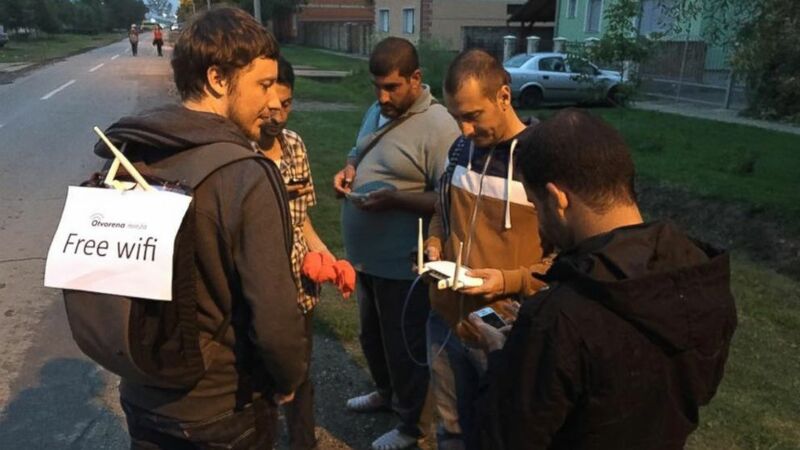 Local mobile operator Hrvatski Telekom has already equipped some refugee centers with free wireless networks and prepaid data cards, while other Croatian operators Vipnet and Tele2 Hrvatska are collecting donations and their employees are volunteering, according to local media reports. However, like in any crowded location, 3G Internet often collapses when too many people try to connect at the same time. A Project Open Network representative said in a written statement that the company hoped the operators would soon install transmission towers to increase the capacity of the mobile network in the border areas. “Network upgrade is necessary not only for refugees but also for all the people who work there -- police, army, civil defense, journalists and everyone else,” the representative added. The tech company works with nodewatcher, an open-source platform that allows everyone who uses it to monitor and contribute to the network. Every user can see the way in which networks are connected and contribute to the network, according to its website. 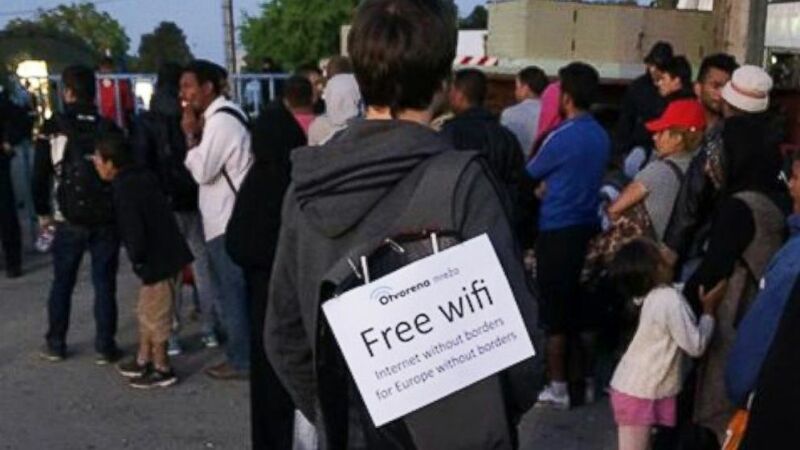 (Project Open Network, otvorenamreza.org ) Project Open Network volunteer carrying a wifi hotspot amid the crowd of refugees and migrants in Opatovac camp, near the town of Tovarnik, Croatia, on September 21nd.